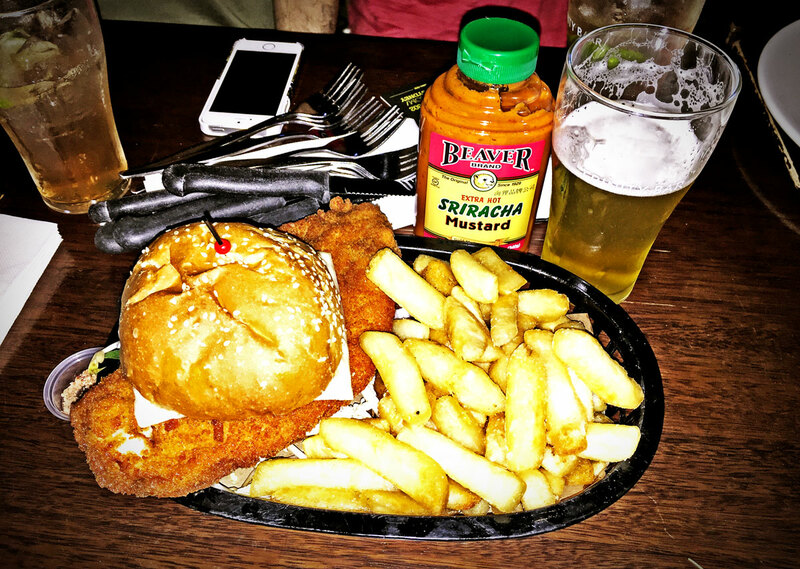 Squawk: The first thing you notice when this bad boy arrives is that the schnitzel is too big for the bun. This is not a huge problem, we just cut (nibbled) it away until it resembled a normal sized burger. Some might say that’s good value, but the schnitty isn’t anything special so more of it isn’t really a bonus, but if you’re starving, this will definitely fill you up. Even if the bird isn’t amazing, they almost make up for it with a wide selection of sauces, three kinds of mustards. And most interestingly, seasoned salts which were a lot of fun to experiment with. Buaawk: The roll wasn’t anything special, the chips were some of the worst we’ve had – soft, light and greasy. They seemed almost hollow, as if they were shells of their former (delicious?) selves. Good chips with any burger seems like a pretty easy get if your cooks care, and Trinity Bar misses the opportunity to get an important staple right. Bonus Points: For the $5 and $6 beer specials and the varied sauce and seasoned salt selection.